ENTRANCE HALL with ceramic tiled floor and dado rail. LOUNGE/DINER with gas real effect fire, television point, frosted double glazed window to side elevation, double glazed window and door to rear garden, radiator. KITCHEN with single drainer stainless steel sink unit, cupboard below, further wall and floor units with working surfaces and tiling to splashback areas, gas cooker point, plumbing for washing machine, frosted double glazed window to side elevation, double glazed window to front elevation, gas Vaillant combi boiler, cooker hood and radiator. BEDROOM 1 with fitted wardrobes , mirrored doors, double glazed window to rear elevation, wood laminate floor, access to loft, radiator. BEDROOM 2 with wood laminate floor, double glazed window to front elevation, radiator. 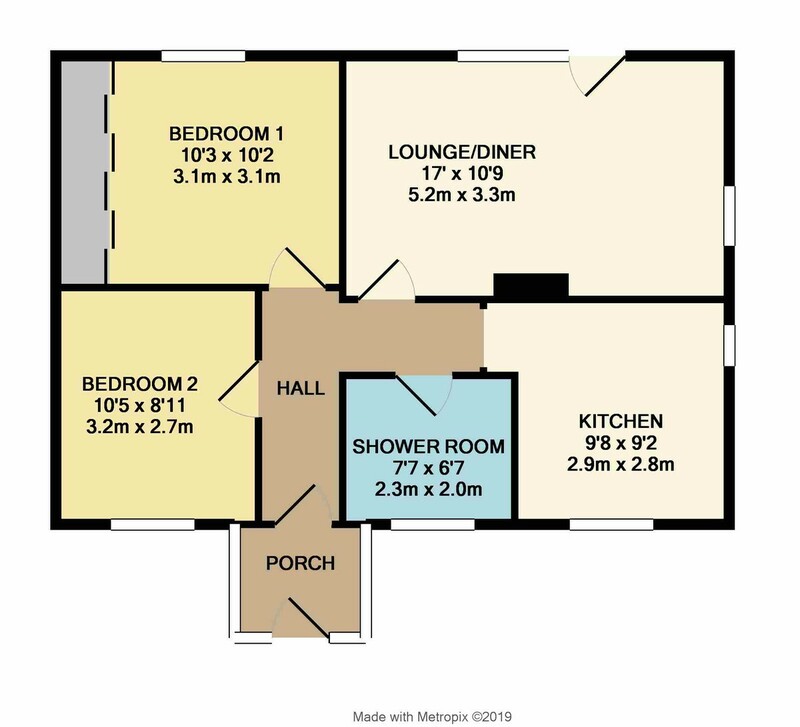 SHOWER ROOM with low level WC, pedestal wash basin, oversized shower cubicle, frosted double glazed window to front elevation, ceramic tiled floor, electric shavers point, heated towel rail, fully tiled walls. SINGLE GARAGE 15' 9" x 8' 6" (4.8m x 2.59m) with up and over door, power and light connected plus useful storage in the rafters. Driveway parking for one car to the front of the garage.